Suppose the company or business you work for announced a policy wherein the company's health insurance carrier would not provide health insurance to employees who ski, snowboard, hand glide or ride motorcycles. Your employer and the health care provider could claim that those activities increase the likelihood of the individual being injured or killed if he or she engages in any of those activities. Effectively your employer and the health insurance company would consider those activities "reckless" behavior and an unreasonable risk, hence proscribe coverage. What would you do? Would you stop skiing, sell your motorcycle? Would you conceal your hang gliding? What would happen if you or a family member were somehow injured and the company found out you are a snowboarder and voided your coverage? Does this sound implausible? It is not, and companies such as Sturm-Ruger Company, which is one of the biggest gun manufactures in the world and virtually has such a policy. 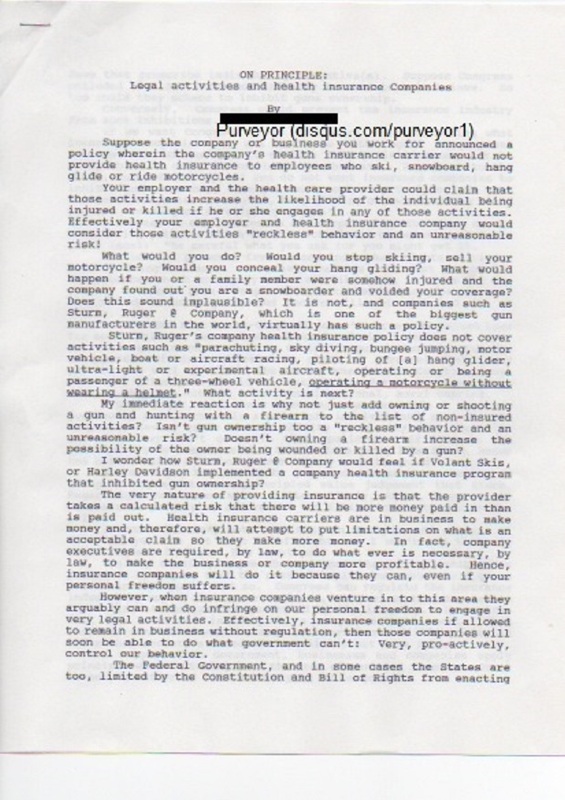 Sturm-Ruger's company health insurance policy does not cover activities such as "parachuting, sky diving, bungee jumping, motor vehicle, boat or aircraft racing, piloting of [a] hang glider, ultra-light or experimental aircraft, operating or being a passenger of a three-wheel vehicle, operating a motorcycle without wearing a helmet." What activity is next? My immediate reaction is why not just add owning or shooting a gun and/or hunting with a firearm to the list of non-insured activities? Isn't gun ownership too a "reckless" behavior and an unreasonable risk? Doesn't owning a firearm increase the possibility of the owner being wounded or killed by a gun? 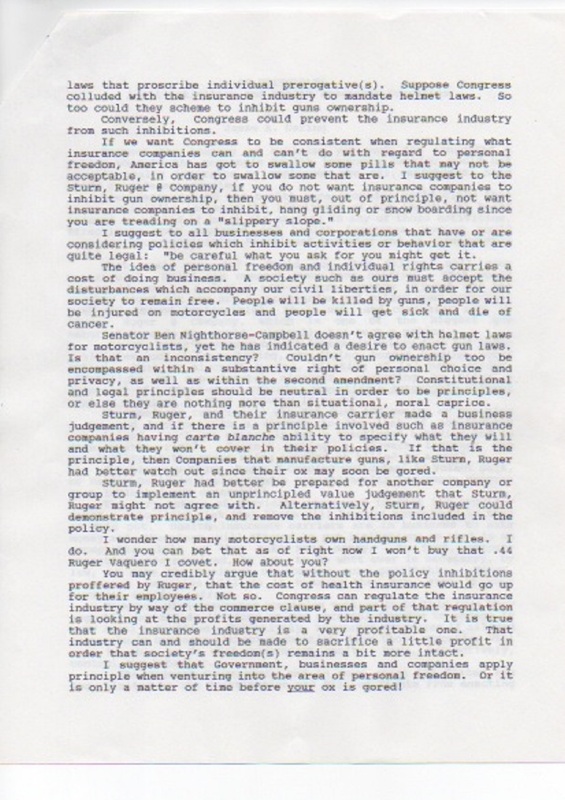 I wonder how Sturm-Ruger Company would feel if Volant Skis, or Harley Davidson implemented a company health insurance program that inhibited gun ownership? The very nature of providing insurance is that the provider takes a calculated risk that there will be more money paid in, than paid out. Health insurance carriers are in business to make money and, therefore, will attempt to put limitations on what is an acceptable claim so they make more money. In fact, company executives are required, by law, to do whatever is necessary, legally, to be profitable. But, insurance companies can do it because they can, thus potentially becoming quasi-governmental? When insurance companies venture into this area they arguably can and do infringe on our personal freedom to engage in very legal activities. Effectively, insurance companies if allowed to remain in business without regulation, then those companies will soon be able to do what government can't: Very pro-actively, control our behavior. The Federal Government, and in some cases the States are too, limited by the Constitution and Bill of Rights from enacting laws that proscribe individual prerogative(s). Suppose Congress colluded with the insurance industry to mandate helmet laws. (For example: South Dakota v. Dole, S.Ct. 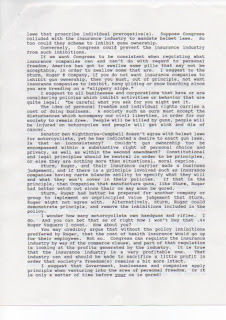 1987 offers insight into Congressional leverage of this nature) So too could Government and business scheme to inhibit gun ownership, etc. A provocative notion? Congress, to be consistent when regulating what insurance companies can and can't do with regard to personal freedom, must accept that America may have to swallow some unpleasant pills in order to swallow some that are, so to speak. Much like the very laws that Congress itself fashions, liberty has a societal cost. I suggest to the Sturm-Ruger Company: If you do not want insurance companies to inhibit gun ownership, then you must, out of principle, not want insurance companies to inhibit, hang gliding, snow boarding or motorcycling since you are treading on a very "slippery slope." I suggest to all businesses and corporations that have or are considering policies which inhibit activities or behavior that are quite legal: "be careful what you ask for, as you might get it." The idea of personal freedom and individual rights carries a cost of doing business. A society such as ours much accept the disturbances which accompany our civil liberties, in order for our society to remain free. People will be killed by guns, people will be injured on motorcycles and people will get sick and die of cancer from smoking. Senator Ben Nighthorse-Campbell doesn't agree with helmet laws for motorcyclists, yet he has indicated a desire to enact gun laws. Isn't that an inconsistency? Couldn't gun ownership too be encompassed within a substantive right of personal choice and privacy, as well as within the second amendment, proper? Constitutional and legal principles should be neutral in order to be principles, or else they are nothing more than situational, moral caprice. 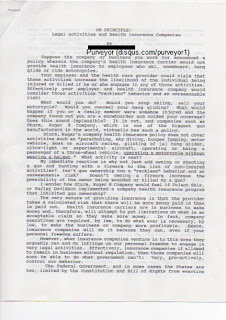 Sturm-Ruger, and their insurance carrier made a business judgement, and if there is a principle involved such as insurance companies having carte blanche ability to specify what they will and what they won't cover in their policies. If that is the principle, then companies that manufacture guns, like Sturm-Ruger had better watch out since their ox too, may soon be gored. Sturm-Ruger had better be prepared for another company or group to implement an unprincipled value judgement that Sturm-Ruger might not agree with. Alternatively, Sturm-Ruger could demonstrate, and remove the inhibitions included in the policy. I wonder how many motorcyclists own handguns and rifles. I do. And you can bet that as of right now I won't buy that .44 Ruger Vaquero I covet. How about you? You may credibly argue that without the policy inhibitions proffered by Ruger, that the cost of health insurance would go up for their employees. Not so, Congress can regulate the insurance industry by way of the commerce clause, and part of that regulation is looking at the profits generated by the industry. It is true that the insurance industry is a very profitable one. That industry can and should be made to sacrifice a little profit in order that society's freedom(s) remain a bit more intact. I suggest that Government, businesses and companies apply principle when venturing into the area of personal freedom. Or it is only a matter of time before your ox is gored!